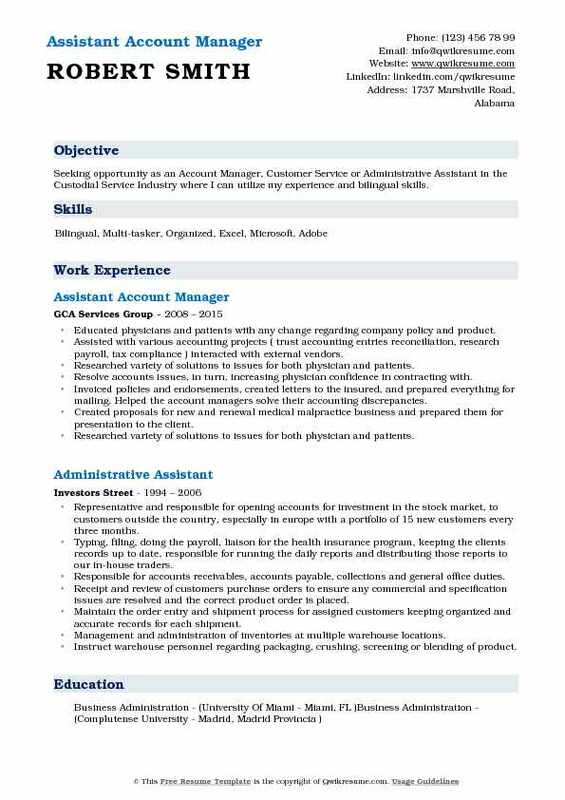 An Assistant Account Manager has abundant responsibilities in their Assistant Account Manager Resume Sample. These managers take charge of accounts and finances of the company in the absence of the account manager, the job tasks include taking care of financial aspects of the company, processing the bills on time, overseeing the accounts receivables and payable, filing tax forms of the company, corresponding with customers and preparation of checks. The other important duties to be shouldered by these assistants are to act as a negotiator between the clients and the company and perform all the administrative tasks of the company. The job role of an Assistant Account Manager requires a good command of English, communicative skills, in-depth business knowledge and effective interactive skills. A candidate must possess a degree in Commerce or Finance or Marketing or its related field. Some hiring employers prefer a Masters degree with related specialization. 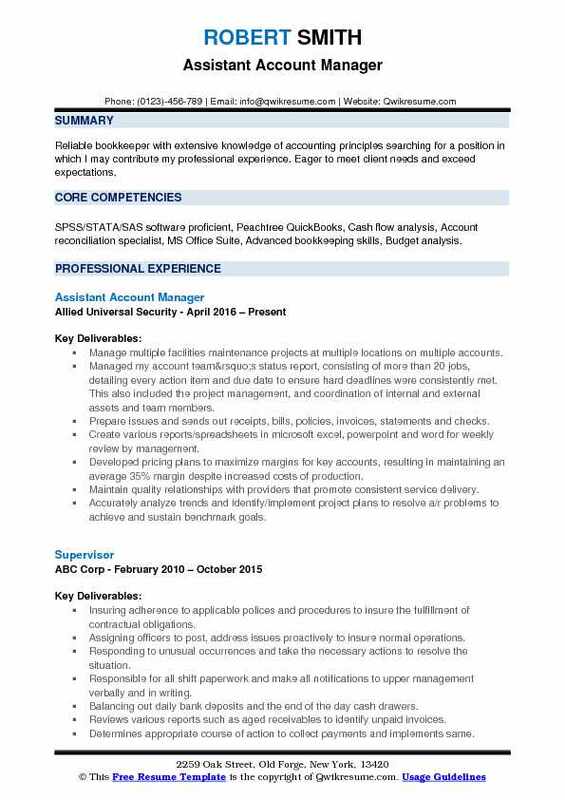 Summary : To contribute my developed skills to a challenging Account Manager position, to a progressive organization offering opportunities for growth and advancement. Reviewed and submitted new business accounts. Assisted producers with market selections, company placements and coverage selections. 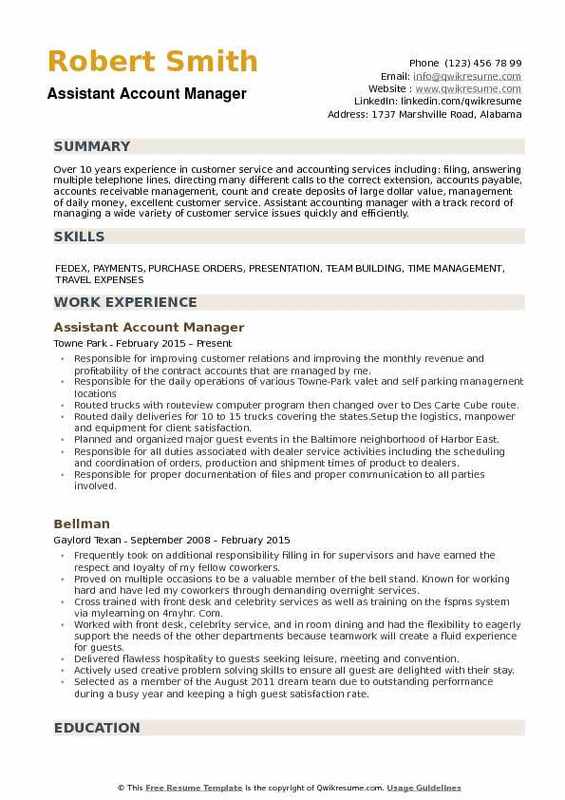 Maintained and serviced individual book of business while assisting account managers as needed. Reviewed client accounting history, responded to accounting inquiries, and corrected account discrepancies including assisting in collections on past due accounts. 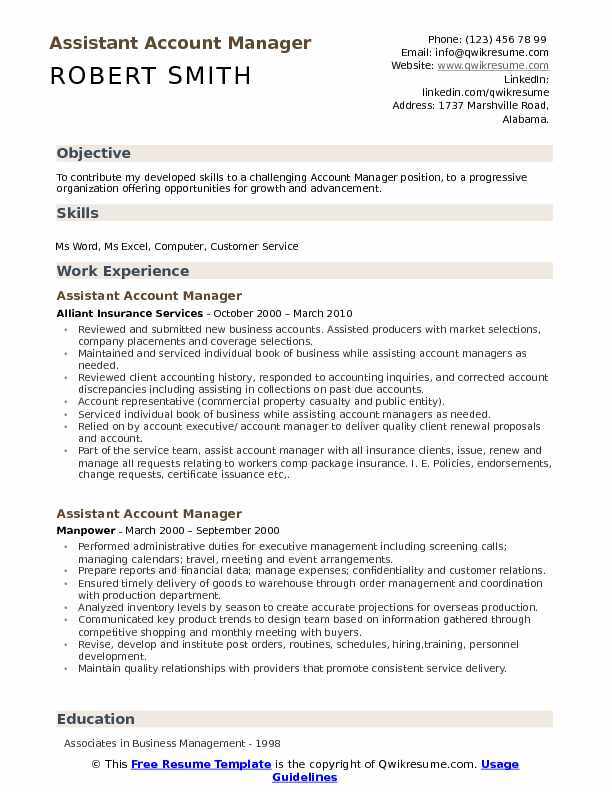 Account representative (commercial property casualty and public entity). 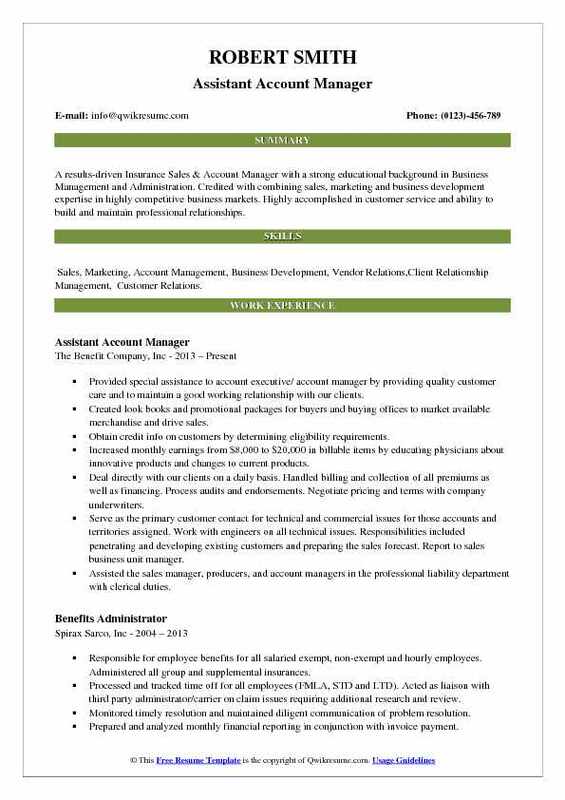 Serviced individual book of business while assisting account managers as needed. 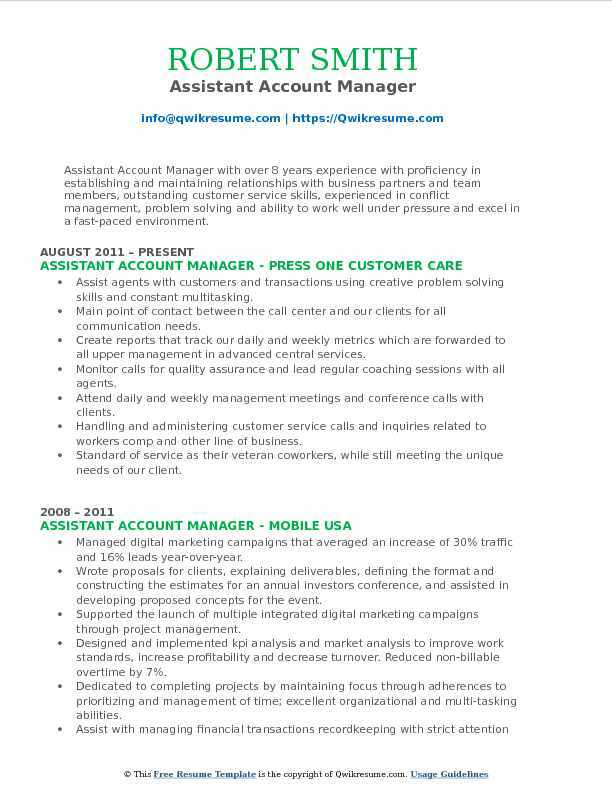 Relied on by account executive/ account manager to deliver quality client renewal proposals and account. Part of the service team, assist account manager with all insurance clients, issue, renew and manage all requests relating to workers comp package insurance. I. E. Policies, endorsements, change requests, certificate issuance etc,. Summary : Reliable bookkeeper with extensive knowledge of accounting principles searching for a position in which I may contribute my professional experience. Eager to meet client needs and exceed expectations. Skills : SPSS/STATA/SAS software proficient, Peachtree QuickBooks, Cash flow analysis, Account reconciliation specialist, MS Office Suite, Advanced bookkeeping skills, Budget analysis. Manage multiple facilities maintenance projects at multiple locations on multiple accounts. Managed my account team’s status report, consisting of more than 20 jobs, detailing every action item and due date to ensure hard deadlines were consistently met. This also included the project management, and coordination of internal and external assets and team members. Prepare issues and sends out receipts, bills, policies, invoices, statements and checks. Create various reports/spreadsheets in microsoft excel, powerpoint and word for weekly review by management. Developed pricing plans to maximize margins for key accounts, resulting in maintaining an average 35% margin despite increased costs of production. Maintain quality relationships with providers that promote consistent service delivery. Accurately analyze trends and identify/implement project plans to resolve a/r problems to achieve and sustain benchmark goals. Summary : A results-driven Insurance Sales & Account Manager with a strong educational background in Business Management and Administration. Credited with combining sales, marketing and business development expertise in highly competitive business markets. Highly accomplished in customer service and ability to build and maintain professional relationships. Skills : Sales, Marketing, Account Management, Business Development, Vendor Relations,Client Relationship Management, Customer Relations. Provided special assistance to account executive/ account manager by providing quality customer care and to maintain a good working relationship with our clients. Created look books and promotional packages for buyers and buying offices to market available merchandise and drive sales. Obtain credit info on customers by determining eligibility requirements. Increased monthly earnings from $8,000 to $20,000 in billable items by educating physicians about innovative products and changes to current products. Deal directly with our clients on a daily basis. Handled billing and collection of all premiums as well as financing. Process audits and endorsements. Negotiate pricing and terms with company underwriters. Serve as the primary customer contact for technical and commercial issues for those accounts and territories assigned. Work with engineers on all technical issues. Responsibilities included penetrating and developing existing customers and preparing the sales forecast. Report to sales business unit manager. Assisted the sales manager, producers, and account managers in the professional liability department with clerical duties. Headline : Candidate with experience in account management, benefits administration, compliance, healthcare reform, client implementation, due diligences, HRIS systems, supervisory roles, and excellent analytical skills seeking relevant job. Works in conjunction and cooperation with compliance and implementation departments to implement insurance benefit plans and HRIS programs for clients. Knowledge of PPACA/ Healthcare reform and assists with making sure the client. Provides ongoing client customer service to continually assure that benefit plans. Analyze client claims and provide detailed documents for the client to utilize for budgeting and projection purposes for forthcoming renewals. Efficient report writing in several HRIS systems with a strong knowledge of system limitations and understanding of the importance of coordinating the system for HR and payroll needs. Strong ability to prioritize daily tasks with urgent client needs both in the office out of the office for client meetings. Efficiently process adjustments and underpaid claims for designated accounts. Effectively identify problems that may impact collections or charges for accounts. 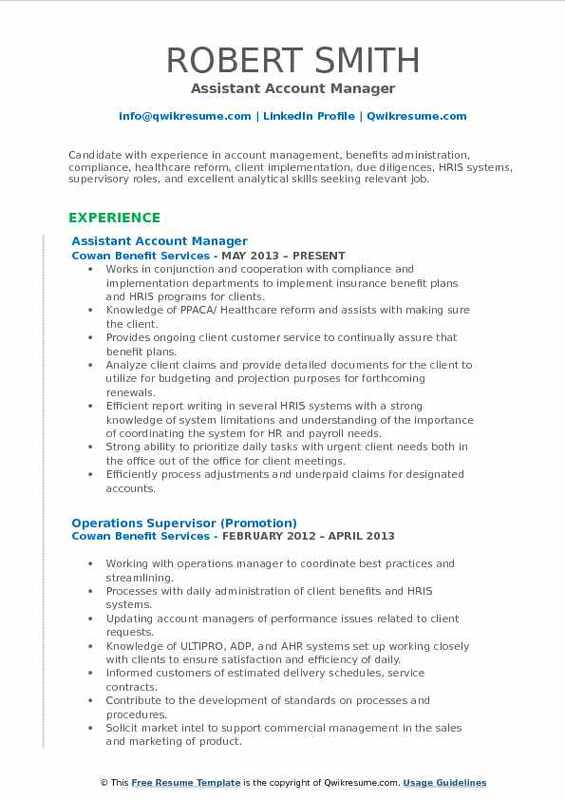 Assist senior account manager and account managers with overall performance of accounts. Summary : Highly accomplished Assistant Account Manager offering more than 5 years of experience in security domain with expertise in supervising, customer service, account management, team management with an exceptional ability to work under pressure, problem solver, and result oriented. Keep correct time of employees, bid on cleaning contracts for clients, safety training, run crew made up of over 45 employees, conduct staff meetings, onboard new members when needed, oversee plans of cleaning operation and make sure plans are implemented daily for cleaning of refinery plant. Oversee and operate state of the art global security operations center. Supervise site staff, providing coaching, recognition and discipline within approved empowerment range. Creating schedules, and ensure that job got done correctly. Managing the security account relation for wake county public schools contract: 16th largest school district in the united states and 3 million dollar contract. Manage day to day physical security operations. Provide direction to 70+ security officers, supervisors, and soc operators. Develop and implement new policies and procedures that help improve the global safety and security department. Perform personnel related duties including hiring, promoting, and terminations. Provide personal security to high level executives and visiting heads of state to ensure they make it to meetings with the client executive team without delay. Coordinate and/or conduct site-specific ojt, client specific training and annual refresher training for security personnel. 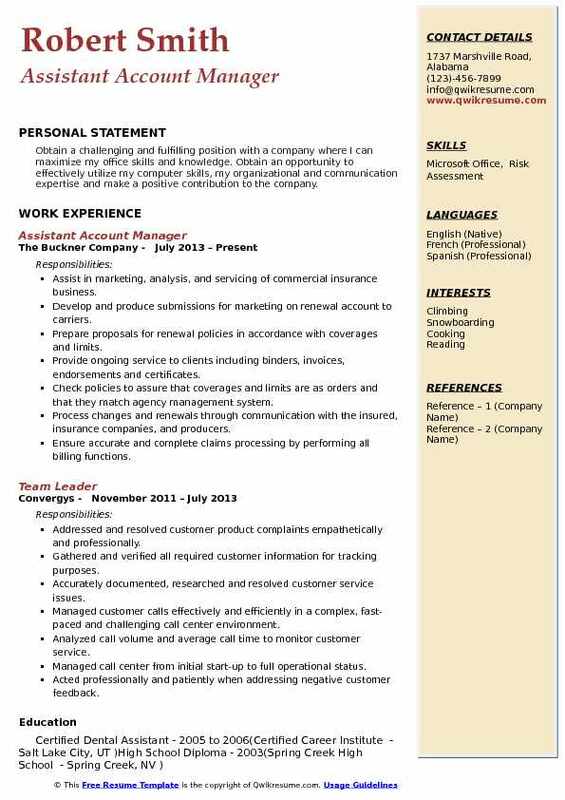 Summary : Seeking opportunity as an Account Manager, Customer Service or Administrative Assistant in the Custodial Service Industry where I can utilize my experience and bilingual skills. Educated physicians and patients with any change regarding company policy and product. Assisted with various accounting projects ( trust accounting entries reconciliation, research payroll, tax compliance ) interacted with external vendors. Researched variety of solutions to issues for both physician and patients. Resolve accounts issues, in turn, increasing physician confidence in contracting with. Invoiced policies and endorsements, created letters to the insured, and prepared everything for mailing. Helped the account managers solve their accounting discrepancies. Created proposals for new and renewal medical malpractice business and prepared them for presentation to the client. Participate in internal review of any customer complaints and develop corrective action plans. Summary : Assistant Account Manager with over 8 years experience with proficiency in establishing and maintaining relationships with business partners and team members, outstanding customer service skills, experienced in conflict management, problem solving and ability to work well under pressure and excel in a fast-paced environment. Assist agents with customers and transactions using creative problem solving skills and constant multitasking. Main point of contact between the call center and our clients for all communication needs. Create reports that track our daily and weekly metrics which are forwarded to all upper management in advanced central services. Monitor calls for quality assurance and lead regular coaching sessions with all agents. Attend daily and weekly management meetings and conference calls with clients. Handling and administering customer service calls and inquiries related to workers comp and other line of business. Standard of service as their veteran coworkers, while still meeting the unique needs of our client. Continuing effort to enhance the quaility and productiveness of our service center. Provide guidance to account supervisors on matters related to performance management, staffing/recruitment, training, hr compliance. Backed up other assistants in the department when they were out of the office, and filled in at the front desk/switchboard. Headline : Secure a Assistant Account Manager position with a growing organization that will allow me to amplify and excel as an associate and individual. Looking for a potential situation where Provide an organization who demonstrates leadership, integrity, and ambition to satisfy their goals and demands. 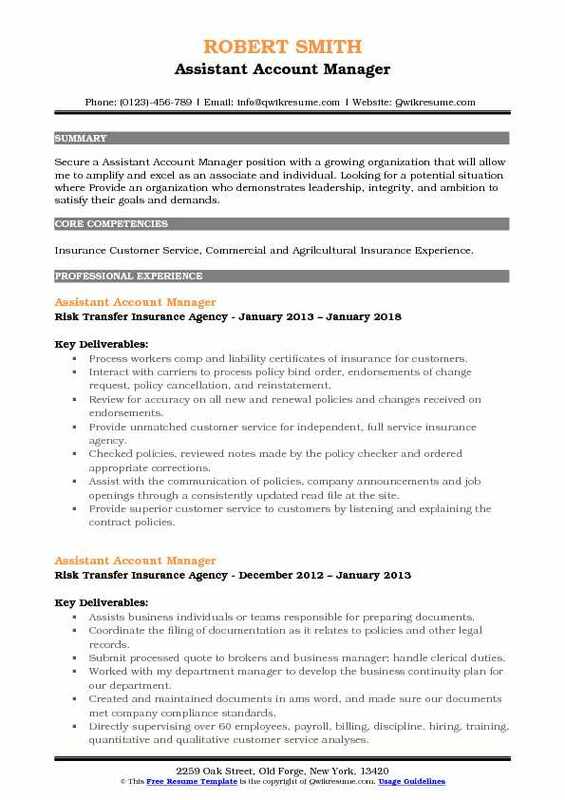 Skills : Insurance Customer Service, Commercial and Agrilcultural Insurance Experience. Process workers comp and liability certificates of insurance for customers. Interact with carriers to process policy bind order, endorsements of change request, policy cancellation, and reinstatement. Review for accuracy on all new and renewal policies and changes received on endorsements. Provide unmatched customer service for independent, full service insurance agency. Checked policies, reviewed notes made by the policy checker and ordered appropriate corrections. Assist with the communication of policies, company announcements and job openings through a consistently updated read file at the site. Provide superior customer service to customers by listening and explaining the contract policies. As one of the account manager, Responsible for maintaining the relationship with the clients, execute all task in a timely manner and provide an exceptional customer experience. Headline : Obtain a challenging and fulfilling position with a company where I can maximize my office skills and knowledge. 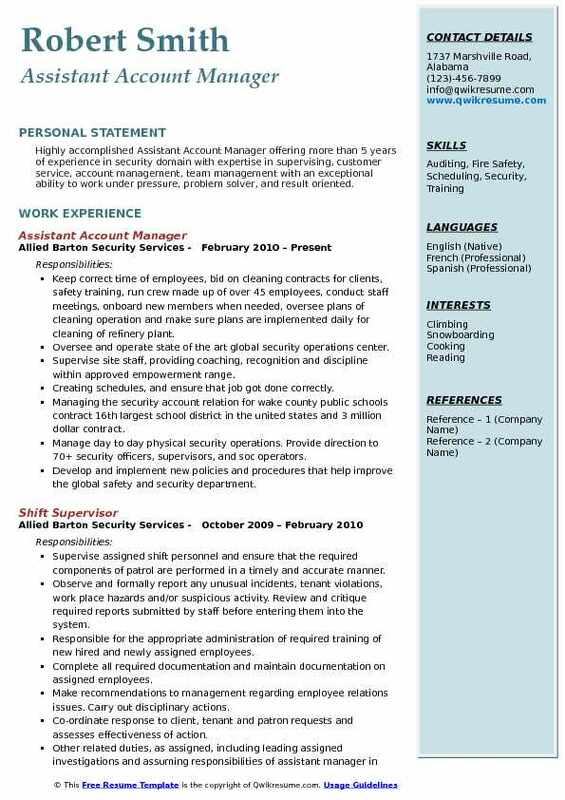 Obtain an opportunity to effectively utilize my computer skills, my organizational and communication expertise and make a positive contribution to the company. Assist in marketing, analysis, and servicing of commercial insurance business. Develop and produce submissions for marketing on renewal account to carriers. Prepare proposals for renewal policies in accordance with coverages and limits. Provide ongoing service to clients including binders, invoices, endorsements and certificates. Check policies to assure that coverages and limits are as orders and that they match agency management system. Process changes and renewals through communication with the insured, insurance companies, and producers. Ensure accurate and complete claims processing by performing all billing functions. Responsible for a variety book of business shared with account manager. Responded to client needs by producing certificates, evidence of insurance forms, policies and other related items. Maintained controls on renewal expirations achieving 80% before effective date. Summary : Over 10 years experience in customer service and accounting services including: filing, answering multiple telephone lines, directing many different calls to the correct extension, accounts payable, accounts receivable management, count and create deposits of large dollar value, management of daily money, excellent customer service. Assistant accounting manager with a track record of managing a wide variety of customer service issues quickly and efficiently. Responsible for improving customer relations and improving the monthly revenue and profitability of the contract accounts that are managed by me. Routed trucks with routeview computer program then changed over to Des Carte Cube route. Routed daily deliveries for 10 to 15 trucks covering the states.Setup the logistics, manpower and equipment for client satisfaction. Planned and organized major guest events in the Baltimore neighborhood of Harbor East. Responsible for all duties associated with dealer service activities including the scheduling and coordination of orders, production and shipment times of product to dealers. Responsible for proper documentation of files and proper communication to all parties involved.